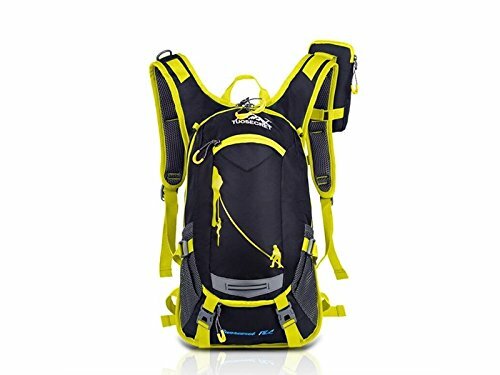 18L hydration backpack is made of ultralight waterproof and tear-resistant nylon fabric.The big capacity water backpack with multi-compartment design and easy-access front zippered pocket, you can keep your gear organized and keep everything separated for quick access. 3D Ventilated mesh offers multi-directional air flow and cushioning to maximize comfort and breathability to keep your back cool. Reflective accents provide enhanced safety in low-light conditions. At the same time, safety whistle in sternum strap for your safety. Rain cover to be used in heavy rain. Detachable pouch for store your cellphone.The mesh cover to hold your helmet and still allowing full access to your running hydration packs.